It's been over two years since the last major version of Pocket Casts debuted. A lot has happened in the podcasting world since then, including Pocket Casts itself being acquired by a consortium of radio stations and podcast companies. The app has also faced strong competition from alternatives like Overcast and Castro. Pocket Casts remains one of the best third-party podcast clients on iOS, but it has started to show its age of late. Updates to the app over the last year have been fairly minor and unimpressive. In hindsight though, it's easy to understand why: the app's development team has been plugging away on a major new update that's officially launched today. Pocket Casts 7 makes the podcast client feel modern again. It introduces a new design alongside important features like Siri shortcuts and AirPlay 2 support, Up Next syncing, episode search, Listening History, and a lot more. If you haven't given the app a try in a while, now is definitely the time to do so. The changes in Pocket Casts 7 start with a new design, which I'm happy to say introduces a tab bar. I've always found that Pocket Casts felt too foreign on iOS for my preferences, which is understandable since the app is cross-platform and exists on Android, Mac, and even Windows. The addition of a tab bar in version 7 though, combined with some changes to the Now Playing screen, make the app feel more iOS-friendly than it's been in a long time. 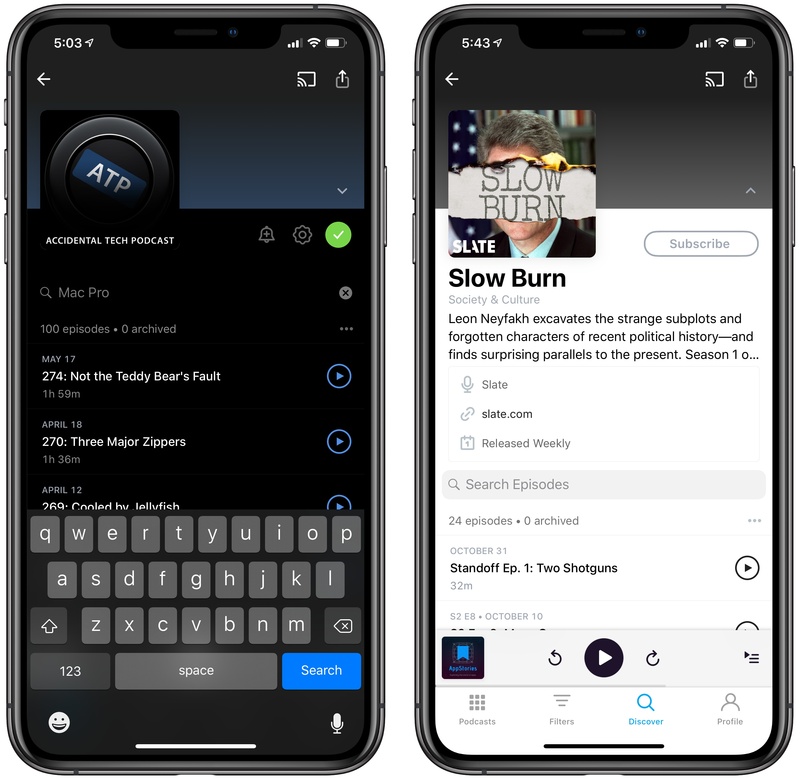 Podcasts and Discover now have their own dedicated tabs, with Filters and Profile rounding out the four navigation options. While much of the content found in these tabs remains the same as before, some visual tweaks make the whole app feel fresh and modern. Controls are easier to find, too, having been relocated to make them more prominent to users. The Now Playing screen is one of my favorite design improvements, as it's been simplified to a single page. 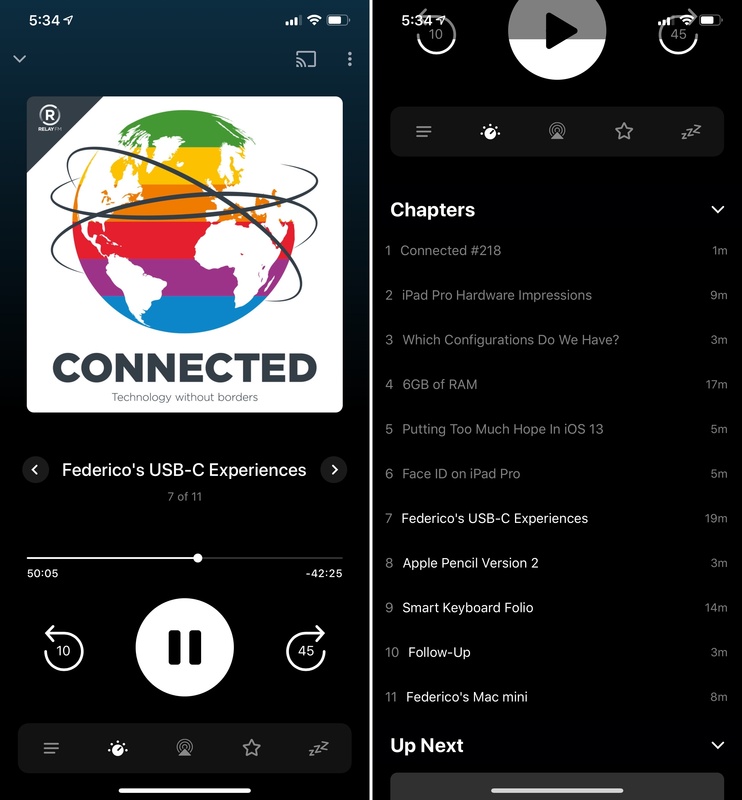 Buttons for show notes, playback effects, AirPlay, and more are readily available, and as you scroll down the page you'll see chapters if they're available, as well as your Up Next queue. The design resembles that of Apple Podcasts, and just like Apple's client you can choose to hide or display chapters and Up Next as you'd like. I understand some users struggle discovering additional content that lies further down on a screen, but for my personal tastes, I find Pocket Casts' new approach a lot more desirable than its old paginated design. Pocket Casts' light and dark themes have been updated and refined, and they look great. One exciting addition in the theme department is a new Extra Dark option that looks amazing on OLED iPhones. I think it's one of the best true black themes available on the App Store. The design improvements in Pocket Casts 7 are great, but the app certainly brings a lot of weighty substance to accompany its style flair. Siri shortcuts. Pocket Casts has added shortcuts for practically anything you could want in your podcast app. You can have shortcuts to play your Up Next queue, or play a specific filter, or an individual podcast; there are also options for next and previous chapter, resume and pause, setting a sleep timer, and even playing a random suggested show. AirPlay 2. HomePod owners and anyone else who uses AirPlay a lot will be glad to hear that Pocket Casts 7 brings full support for AirPlay 2, meaning the old, annoying two-second delays are a thing of the past. Up Next syncing. One of Pocket Casts' greatest strengths is that it lives on virtually every platform – the web, iPhone, iPad, Mac, Android, and Windows. Now your Up Next queue in the app syncs so that no matter what device you're listening on, you'll have the exact right lineup of shows waiting for you. Episode search. Every show now features its own search option so you can filter down to just the exact episode(s) you're looking for. Based on my testing, episode search extends not just to episode titles, but show notes as well. I'm not sure how accurate it is, but this looks about right for ATP. Play without subscribing. No longer do you have to subscribe to a show before you can start playing it. Pocket Casts 7 adds play buttons to every episode of every show in its database, so after a quick search to find what you're looking for, all you need to do is tap play to start listening. Listening History. I may be the only person who appreciates it, but I really like how Apple Podcasts stores a running log of episodes you've listened to recently at the bottom of the screen. For me it's a helpful way to go back and easily visit links found in show notes after an episode's been completed. Pocket Casts now offers a similar feature in the form of Listening History, which can be accessed from the new Profile tab. Streaming playback effects. Previously, playback effects like Trim Silence and Volume Boost could only be used with episodes that had been fully downloaded beforehand. As of today, however, you can use those effects when streaming a podcast too. Improved Discovery. The Discovery screen has gotten a big overhaul, and it looks great. Its design reminds me a lot of the App Store and other Apple media apps, featuring curated collections, trending shows, categories, and more. Apple Watch app improvements. The already-solid Pocket Casts Watch app has been improved to offer volume control using the Digital Crown, and you can also adjust playback effects from your wrist now. If there was any concern about Pocket Casts' future following its acquisition earlier this year, that fear can be put to rest for a while. 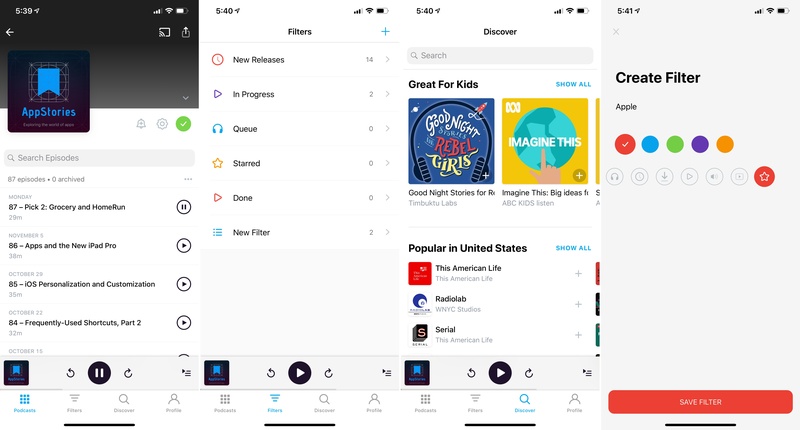 Pocket Casts 7 is a fantastic update, bringing a modern design that's both beautiful and functional, along with a huge number of valuable features that make the app more formidable than ever before. Though I'm not crazy about how quiet the app's update cycle has been lately, today's release easily makes up for that and sets Pocket Casts on a strong trajectory for the future. Pocket Casts 7 is a free update for all existing customers. For those new to the app, it's a one-time $3.99 payment.